It was a gift from Queen Nefertari of Egypt to the Queen of the Hittites. muklālu isn't actually an Egyptian word. It is a transliteration from the Akkadian cuneiform. A muklālu was an item of clothing worn by the Hittite rulers. It was probably a shawl, cape, or hood, and we have sources stating that it could be either red or blue. The coloured-linen 'Maklalu-material' mentioned in the passage was simply the material from which the muklālu was made. The word muklālu had its origins in the Assyrian language. The first thing to note is that muklālu, or maklulu, is not an Egyptian word. It is Akkadian cuneiform, and the passage you quote is from a letter from Nefertari, wife of Ramesses II, to the Hittite Queen Puduhepa, wife of Hattushili III, after the peace treaty which followed the battle of Kadesh. 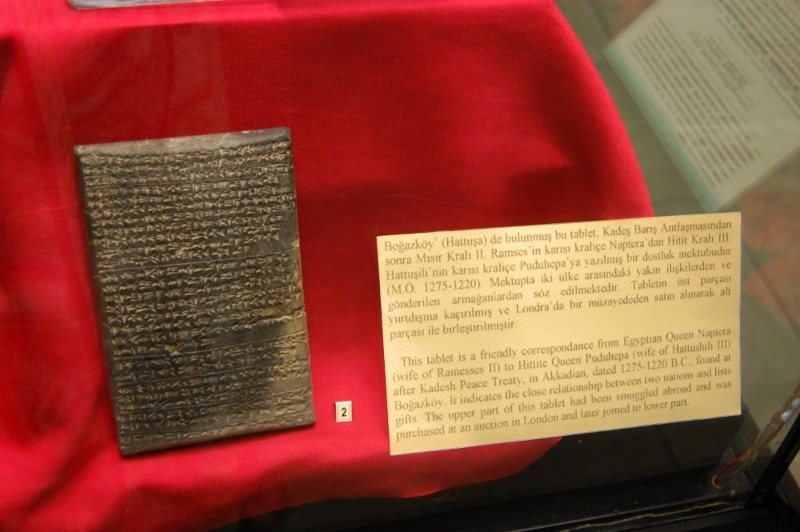 The tablet is currently in the Museum of Anatolian Civilizations in Ankara. The muklālu, or maklulu, was an item of clothing. It was probably a shawl, cape, or hood, and we have sources stating that it could be either red or blue (which is why it is described as "coloured linen" in the letter, although, sadly exactly which colour was being sent isn't specified)). So 'muklālu material' is just the material used to make a muklālu. Assyrian Dictionary of the Oriental Institute of the University of Chicago, vol 10, p137. maklulu (a garment) CAD M/i, 137b s.v. 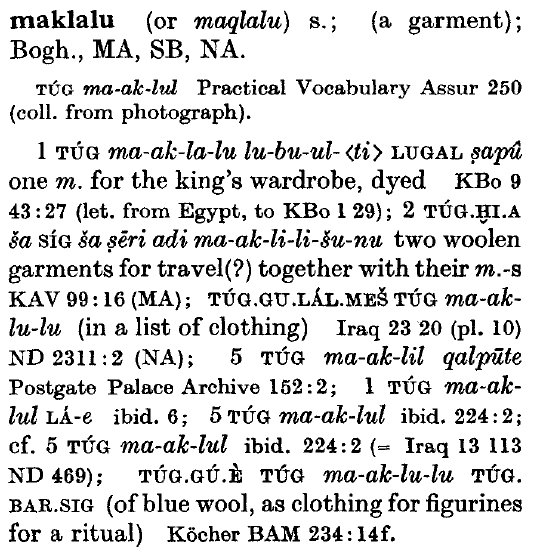 ‘maklalu’ This is an article of clothing, better attested in Neo-Assyrian texts. In MARV 1.24:7’ it appears to be ‘for work’ (ša kin), and to be of some technique or workmanship which is lost at the broken end of the line. In KAV 99 from the Babu-aḫa-iddina archive we have “two work garments of the countryside, together with their maklulu”, suggesting that it could be an ancillary item, conceivably ‘hood’ (given the association of the root kll with headgear in other words). Nicholas Postgate: "Wool, Hair and Textiles in Assyria", in: Catherine Breniquet and Cécile Michel (Eds. ): "Wool Economy In The Ancient Near East And The Aegean. From the Beginnings of Sheep Husbandry to Institutional Textile Industry", Oxbow Books: Oxford, Philadelphia, 2014, p 401– 427.
maklulu or muklālu (muqlālu). This term, derived from the verb qalālu, ‘to be light, weak’, seems to denote a wool shawl or a cape. In a Middle Assyrian text wool garments (lubēru) with their maklalu are listed. The textiles in question are qualified as garments ša ṣēri, ‘of the steppe/countryside’, perhaps, to be intended as garments with capes which were used for travel or which were characteristic of the nomads’ dress. Postgate suggests the translation ‘hood’. Moreover, it seems that in 2nd-millennium BC Assyria also maklulus for work (ša šipri/KIN) were in use. The Neo-Assyrian maklulu came in two varieties: one with sleeves and one without sleeves. Administrative texts dealing with textiles tell us that the muklālu could be made of biršu, and that it could have a red coloured front-piece and (precious) stones sewn onto it, perhaps along the border. Another document specifies that the colour used for the front-part of the muklālu was the commercial red. Leaving us to conclude that this probably was not really an Egyptian garment, at least not one 'invented there'. Probably copied from the Assyrian/Akkadian style or imported at a premium from there. But the words seem to be used as internationally defined terms to facilitate trade, being identical and equally well understood in Eygptian, Akkadian, Hittite markets. From the passage cited it seems to imply that the material used would be linen. But together with the assumption that it might mean hood/hooded these two assumptions are both not entirely clear. First the word for hood is listed separately in a letter as parsigu (AHw II 836). Second the material used for it might actually be linen, wool, or byssos. Conversely the term listed as one possible material was "birsu; pi. m. & f. (a coarse fabric, phps.) 'felt'." Since most of the time the maklalu material is actually listed as "of colourful fine linen" or "of kingly linen" (Cf James Michael Burgin: "Aspects Of Religious Administration In The Hittite Late New Kingdom", Dissertation, University of Chicago, 2016.PDF) this suggests even more so that the material origin itself is not meant but another aspect of the garment to be furnished from that, with different levels of quality available. In conclusion we might assume that maklalus in that letter were some kind of cape, usually dyed red or blue, of a comparatively light material of various origins, in a style of "barbarous" or foreign origins. Its name maklalus coming from Sumerian/Akkadian language but in the international trade network of the Eastern Mediterranean coming to denote one specialised and recognisable type of clothing. "Made for work" if intended for lower classes and "made for travel" in the case of higher classes. Not the answer you're looking for? Browse other questions tagged language ancient-egypt clothing or ask your own question. Was there public resistance to Queen Hatshepsut's reign in ancient Egypt? What is the layout of Ancient Egyptian pyramid shafts?